Cotton soft, cotton cool, Falke Cotton Step Invisible Shoe Liners have all the virtues of a fine knit 'no show' shoe lining sock but with the breathable, moisture- absorbing qualities of high grade cotton. The low cut style ensures an un-noticeable but secure liner, courtesy of an anti-slip system around the heel. 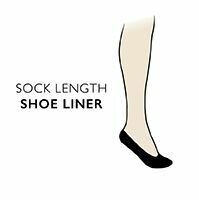 Falke Cotton Step Invisible Shoe Liners can enhance the comfort levels of all your footwear, from your favourite heels to casual sports shoes, saving you from the misery that stickiness, slipping and rubbing can bring to a day or night out.